"Give me ink or give me death!" While that may be a little exaggerated, autographs are the battle cry of many collectors. 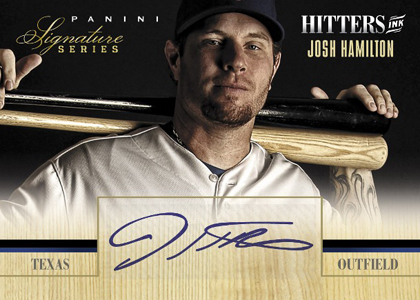 2012 Panini Signature Series Baseball certainly brings it, promising three autographs in every single-pack box. 1996 Leaf Signature Series was the first baseball card set to offer an autograph in every pack. The hobby has changed since then and the Signature Series brand has bumped around, but its foundations remain the same. The ink flows in 2012 Panini Signature Series Baseball with a checklist that includes current players and retired stars. 2012 Panini Signature Series Baseball has several different levels of autographs. Signatures features on-card autographs and serial numbering to 99 or less. Numbered to 299, Rated Rookies Patches brings back the iconic subset name with a series of patch autographs from first-year players. Autographs are signed on white fabric that have a Rated Rookie logo manufactured patch on them. 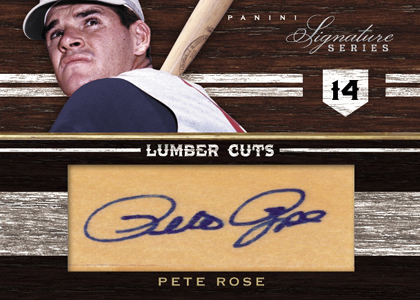 Lumber Cuts have players sign on wood while Game Ball Signatures are signed on baseball leather. 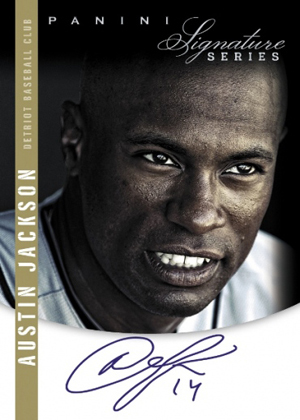 Other autograph inserts include Signature Stats, Hitters Ink Autographs and Diamond Cuts, which have cut signatures. Collectors can look for up to six autographs on a single card. 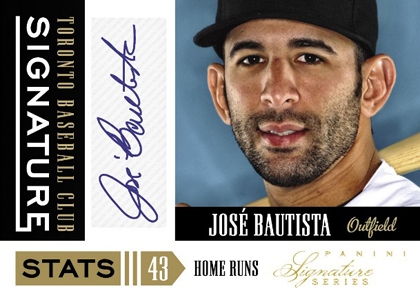 All base cards in 2012 Panini Signature Series Baseball are numbered to 499 or less. Panini has opted for lots of tightly cropped images that show lots of sharp detail and intensity. This helps mask the fact that the company cannot use MLB licenses as the set is licensed only by the MLBPA. The images stand out much better than most of the first sets Panini made under the deal. Good: A diverse product; three autographs per pack in addition to three base cards or parallels which can consist of rookies, veterans, and legends; visually appealing base cards and inserts. Bad: Cards lack one element: MLB logos; because the checklist is so diverse and there are only six cards per pack, it would take a lot to complete a set. 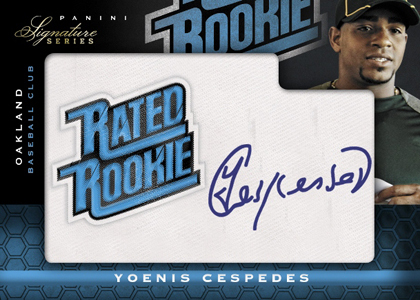 The Bottom Line: Panini Signature Series Baseball uses crisp photos and a design that eye-catching and comparable to Studio Baseball sets from the early-90s. Although it's not licensed by MLB, Panini has delivered another quality product. 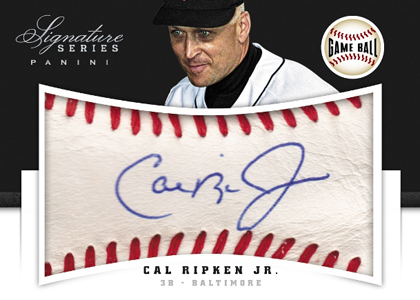 The 2012 Panini Signature Series Baseball base card design is a sort of a throwback tribute to the Donruss Studio product from the 90s. It uses an up-close face shot, and dark background. These elements give a nice feeling to the set. Unfortunately, you only get three base cards per box. With 100 cards in the base set, it is going to be very expensive to complete the set. The manufactured patches lack an appealing design and become and afterthought with the additions of the Sweet Spot-style Game Ball Signatures. That said, the inclusion of the Rated Rookie emblem from the past gives the manufactured patch cards a nice nostalgic look. Many of the autographs are on stickers, which is something a high-end product should try to avoid. There are also redemptions, another letdown. The overall design is crisp and appealing. However, it lacks the MLB logos, which isn't ideal for some collectors. The checklist is vast with a good amount of numbered inserts, autographs, and game-used cards. The checklist highlights rookies, which are numbered to 299. Because they are in less supply, pulling a veteran or legend is something to cheer about. The autographed insert sets are all numbered 299 or less. There is an eclectic selection of autographs inserts sets for collectors to chase. To many collectors, the price is a bit high given that the product seems to be more geared toward prospectors. While there is some nice potential high-end content, a price tag closer to $75 seems more appropriate. 2012 Panini Signature Series Baseball product is a decent product. There is definitely quality and fun to be had. The price is quite high and may deter some. The fact that the product is not licensed also takes away from some of the excitement. By far the best looking MLB Product of 2012. If this product does not hit top of the line, I will leave the hobby. Topps cards keeps rehashing old styles and plays it at the new look. Great new look Panini this should be the of 2012 set of the year! Certainly one of the best checklists of the year. The INKredible 6 are pretty sweet..Priced fairly for the amount of cards with the players in it. Picked a few of these up from a local hobby shop. 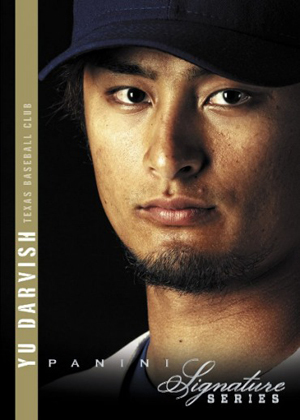 The creativity of featuring the player without the MLB license is nothing short of genius. The photography is stunning. Expert cropping and close-up studio shots of players makes it look and feel like it is supposed to be all about the individual player. Kinda like how card collecting of old used to be. These days, people are too hung up about the logo. Teams have no loyalty towards their players, as turnover rate has skyrocketed. Can’t stand what the Braves have been doing this offseason. Anyway, I digress. As a collector, I actually don’t care so much about the ink. I love looking at and admiring the design and the photographs. The ink is just an extra special added bonus. I’m also in it to collect players, not logos. I just wish I wasn’t three years late on this particular product.